On black Friday I wake in the wee hours of the morning to begin Christmas shopping and also purchase my favorite and the world’s most popular house plant, the poinsettia. I just love them. They bring color to the dull gray hues of winter. I think you can buy a poinsettia for every color in the rainbow. Almost all businesses and most homes will display at least one poinsettia during the holiday season, including mine. Keeping your poinsettia colorful and healthy is relatively simple (at least for a couple of months). Place it in a sunny location away from drafts, maintaining room temperature between 60-70 degrees. When the soil is dry to the touch, water thoroughly, allowing the water to drain out the bottom. Fertilizer is not needed unless you are trying to get it to re-bloom next season. I have read and been told that you can keep poinsettias all year long. This is something that I have not tried. My poinsettias are neglected after Christmas and eventually are dumped into the compost pile. I’ve always thought of the poinsettia as a seasonal plant rather than a house plant. My other houseplants live all year around and avoid the compost pile; so why not the poinsettia? I simply have not tried. I set a goal: to treat my poinsettia as a houseplant. It may even evolve into a 4-H project for my oldest daughter. First, I must convince her it’s a worthy project which will probably be more difficult than getting the poinsettia to re-bloom. With time and research on long-term poinsettia care, I should have a great blog for next year. 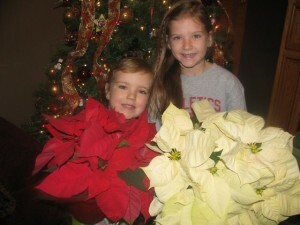 If you have had success with getting poinsettias to re-bloom, please let me know. I just got one as a gift from a student. Good info. I just watered it thinking I probably should n opened my blinds. It was a good article because I am clueless about plants n would love to have it at least through Christmas!